Update 2012-06-10 – It gets worse, see how many Twitter bots follow brands (comment with link to paper) – Dell, Ikea, Southwest. Is Robert Scoble right in claiming Twitter is the new ghost town and Facebook is…? Does a Twitter chat represent value for your target audience? From what I see, there is still a gap of four years between acceptance and usage between Europe and the US. Still a lot of “blasts” and buy my stuff offers in the social web (on both sides of the ocean). So what about Twitter chat, is it something people use to blast their messages or a tool by which chat participants thoughtfully respond to the expert or moderator’s tweets? Blasted messages or a stream of thoughtful tweets? On Twitter I do not always have the time to read people’s personal replies to others, and things get especially confusing if I have not seen the previous messages that led to a thank you, and so forth. You read until here, so read the rest (just click below) but first, sign up with your email (5,000 people have already done so) to get the next blog post first in your inbox. Sign up for our blog and get the next marketing update from Dr KPI first. Is Twitter a news tool or social space? The number of tweets have gone up. Unfortunately, this means that people are getting overloaded, resulting in most poeple following no more than 80 people – why follow more when you cannot keep up? Controlling the amount of ‘noise’ is also much more difficult on Twitter than on Facebook, for instance. Scoble would probably reply that while Twitter may not be a ghost town yet, the more it gets used to gain insights and news, the less attractive it becomes for the majority. For me, it was and always will be more of an ‘information utility’, and as Scoble points out, less of a social community. Therefore, it might become more and more empty. Are Facebook and Google+ going up in your world? What about Twitter – are your numbers of followers and/or replies staying flat? How about the time spent reading other people’s content – on the up- or downswing? Your thoughts – PLEASE click here and leave a comment at the bottom of this post. Are Twitter chats lame? What do you think? – stay on topic during discussions? Here are some of our results. Fact: The first 200 out of 1,000 tweets offered no relevant content – where is the beef? Find the archive of the 2012-05-31 chat with Bernard Warner and our discussion on Xing Social Media Monitoring about Twitter Chat. 1. Spread the news: Chats are a good way to spread news to a larger audience about a conference, new book or other event, such as a client appreciation day. Of course, it also helps build experts’ visibility and reputation. 2. Post additional insights before chat: Questions, slides, video, white papers are just a few that come to mind – they all help prepare your audience and focus the chat. 3. Secure value proposition for your clients: Chats can allow us to learn from each other. To facilitate this, keep the number of attendees relatively small. Otherwise, some clients will likely get stressed out with so many tweets every single minute for an hour. 4. Measure and tune your engagement: If you want more people to sign up and pay to attend for a conference (see above chat), see if they do. Thus, define and measure the outcome. Better to fail quick and drop Twitter chat, than continue without much success. – Company failures: Why is Twitter so difficult? How do you decide which chat to attend? Please leave a comment! 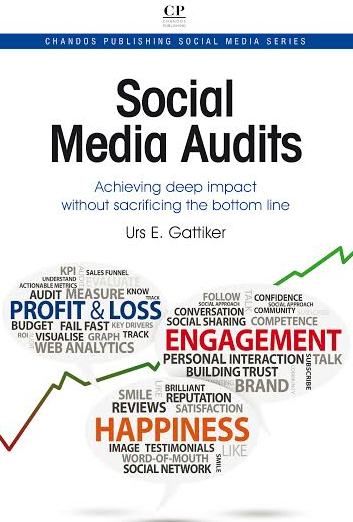 Tip: Search for more ComMetrics and CyTRAP sources on good practice, measurement, social media social CRM, reputation, ROI (click to query). Marco Camisani Calzolari @marcocc:twitter compiled a study into 39 brands on Twitter. He used an algorithm to determine the behaviour of followers.Using key indicators into what type of behavior was likely that of a bot, he found that up to 46% of followers were likely to be automated bots. 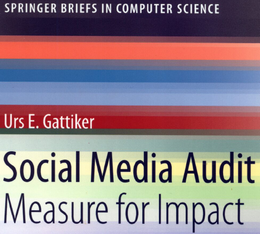 The study took a sample of each brand’s followers and scored their ‘Twitter behavior’ whereby a follower that logged into her account through different clients (e.g., Tweetdeck, Buffer, Twitter webpage) or a profile containing a name with an image and physical address where all factors that were scored (if yes, 1, 2 or 3 points). 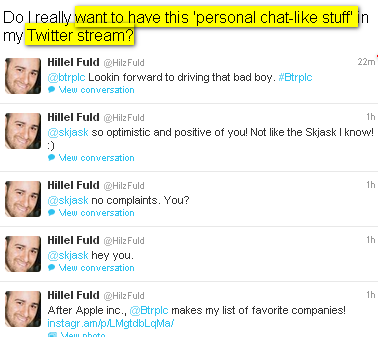 I like the examples of Twitter chatting that you included in your blog. They show what works and what not. Being overloaded is one of the reasons why people tend to reply in a short and maybe very pain way. But time is money as they say. However, a conversation should be meaningful in any case. 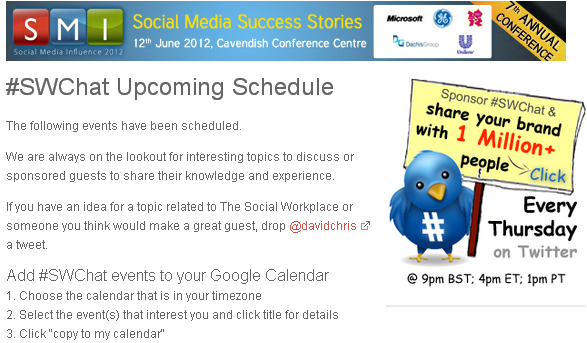 I like the way you explain potential problems for Twitter chat – very clear and useful tips. Everyone can definitely learn a lot and I did the same. It’s interesting that it’s not easy to see people’s emotions and you can only guess how they felt while chatting. I tried to show how emotional a discussion can be in my latest blog devoted to the related topic “How to listen to customers” (thanks for your great comment). But Twitter is different – very short messages and little space. Thanks so much for your comment. Yes the listening is the big challenge with a Twitter chat and most media. In its simplest form you use a reply such as ” @OlgaHenggi:twitter I saw your tweet, thanks…” However, to acknowledge the many random thoughts as shown by the streem of tweets going by makes it hard to reply and acknowledge and receipt of the message. In other words – conversation is a two-way street – but a Twitter chat does not really work in letting us have a conversation. On top, if your followers are bots as happens much with brands as Marco @Marcocc:twitter found with his research (see comment above), how can you have a conversation with machines? If the above is true though, Twitter will usually not be able to satisfy our need to get acknowledged and replied to properly. Olga, thanks so much for stopping by and taking the time I value your input. Thank you for your reply that shows you are a good listener. And I know your chatting skills on Twitter are great – just admire your professionalism and energy. I agree that Twitter chats don’t let us have a conversation but look at the button “view conversation” on Twitter. Maybe you can see not more than two replies there and this could mean there is no any conversation but it’s possible. Anyway, what I want to say that Twitter encourages their members to have conversations. The difficult point is that two strangers maybe won’t have a long conversation even if they reply each other, say, once. Anyway, it’s very difficult to write a thoughtful message (140 characters) and send it to … the whole world Any communication requires a well thought strategy. Olga, I agree wholeheartedly, 2 total strangers are unlikely to have a long face-to-face conversation unless they hit it right off. If they do not, they will quickly move on. Of course, if you share a common background, for instance, such as having gone to school together you can more easily talk. And we all have experienced the situation where we have not seen somebody for years, met again and after 2 minutes it felt like we had the last conversation yesterday. Accordingly, I just cannot see having a conversation using Twitter…. but maybe with a friend on Facebook, a customer replying on our blog and so forth. Thanks for listening and having an online conversation with me Olga! Next post: Where is the LinkedIn, Twitter or Xing ROI?